I want more of those peaches! Alas, I don’t believe there are any more. The last of them went to dinner tonight. And it was a damn fine dinner! At the luncheon after the services, we were talking about different things and he mentioned a local Guam pepper he uses on everything. Naturally, I was intriqued, and he went out to his car and brought in a small jar of a firey red powder. One little dip of the finger had my eyes watering and my tastebuds clamoring for more! He said he’d send me some when he got home. I love sweet/spicy flavor combinations, and these fantastic peaches were the perfect foil for the hot and spicy pepper. I floured and then browned two boneless pork chops and took them out of the pan. I added 1 sliced red onion and cooked it down. 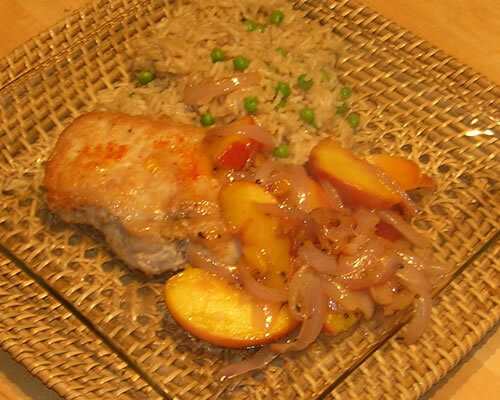 I added two sliced peaches, sprinkled a bit of the ground pepper, salt, and black pepper, put the pork chops back in, covered the pan and continued cooking about 10 minutes. Served it all with a homemade rice-a-roni of angel hair spaghetti, rice, peas, and beef broth. My stomach is definitely smiling tonight!